Met David Moorhouse & Alan Kane, Mark and Rachel at Kumeu. It was an excellent night. It cleared late afternoon and we thought we might get some observing done. I was going to Kumeu to pick up the Dob so I could be ready for Waharau this weekend, so the fact it was nice and clear, was a definite bonus. Dave was at Kumeu with his new 8 Inch Binocular and these we easy to use and were user friendly. Some comparisons were to be done tonight with a Denkmeier binoviewer. Glenn Burgess bought these along for good test. Planned to work through the April observing List tonignt and get home before it gets too late. M 105 Galaxy 88x Digital Setting Circles Testing. JOG Observing Group. M 65 Galaxy 88x Digital Setting Circles Testing. JOG Observing Group. M 66 Galaxy 88x Digital Setting Circles Testing. JOG Observing Group. M 95 Galaxy 88x Digital Setting Circles Testing. JOG Observing Group. M 96 Galaxy 88x Digital Setting Circles Testing. JOG Observing Group. NGC 5128 Galaxy 88x Digital Setting Circles Testing. JOG Observing Group. NGC 5139 Globular Cluster 88x Digital Setting Circles Testing. JOG Observing Group. NGC 3511 Galaxy 88x Fairly bright galaxy with an even brightness. Elogated spiral 3 times as long as wide. The nearby round NGC3513 makes a striking pair. April JOG Target List Object. NGC 3513 Galaxy 114x Compact round galaxy of medium brightness. Makes a nice pair with the nearby oval NGC 3511. NGC 3585 Galaxy 88x Very bright and compact oval galaxy with a bright core. April JOG Target List Object. NGC 3628 Galaxy 88x Digital Setting Circles Testing. JOG Observing Group. NGC 3717 Galaxy 88x Faint, very elongated skinny galaxy with a 12.5 mag star embedded in core. Dave Moorhouse had this object checked by CCD during the evening, to determine nature of the star. Star is external to the object (foreground) and therefore not a supernova. April JOG Target List Object. Nice and steady the views of Jupiter at 150x plus were very good. Over 200x seemed to soften everything too much. Working through some of the objects on the April list, Dave, Guy and I stumbled onto NGC3717, an edge on spiral that appeared to have a star embedded into it and not listed on the star charts. Possibly a supernova, remind you couple of similar events, Brocky? 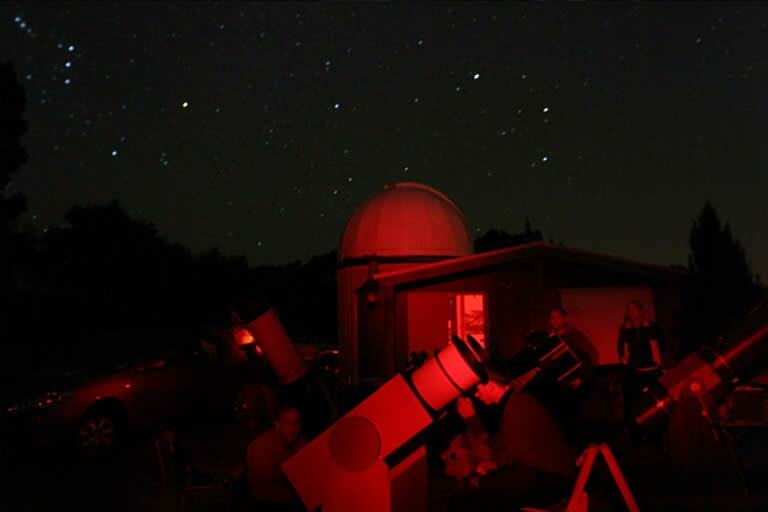 Dave made call to Grant Christie who was using the Nustrini telescope, at the Stardome. Grant imaged the galaxy and confirmed nothing of special interest. At least it kept us in suspense for 40 minutes. Roll on the internet access at Kumeu, the DDS images would have confirmed the star. I had problems powering the laptop, however I have the Palm as well and proved a worthy backup, once I replaced the batteries in the Palm. Again very pleased with the pointing. With the improvements to the observatory and removal of the old fence post, there is now more observing space. Kumeu is an excellent place to observe. Once again, thanks to Steve Calverley for access to the observatory and Dave Moorhouse who works behind the scenes, making improvement to make the Kumeu Observatory the place it is today. Packed up the trialer in preparation for Waharau this weekend.